Rainy day Hunters, originally uploaded by the workroom. The best purchase that I’ve made this year has got to be my Hunter Wellington boots. 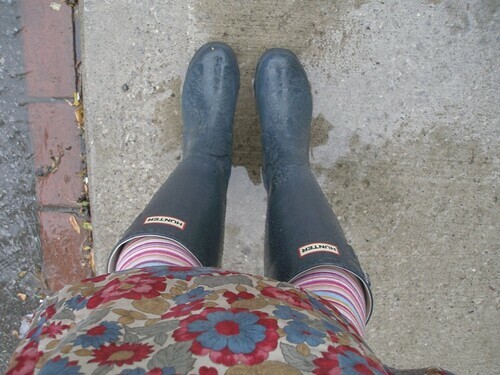 I’ve never had such fun tromping around in the rain. It’s so nice to be at an age where you get total satisfaction just from being practical. I also quite enjoy knowing that the Queen and I share similar footwear. That vintage dress you see there was a generous gift from Megan. (Megan – Thank you! It fits and I love it!) Those stripey socks are much loved, but rarely worn. I’m happy I was able to fit them into today’s outfit, they remind me of candy. I’ve got a new little tutorial for you today. My name is Mike and I work on the website for Hunter Boots in the UK. I stumbled across your blog today and wonder if you mind me putting a link to this entry on our website? You’ve very kindly linked to our homepage so I’d like to return the favour, plus it makes good content for our site and hopefully directs a bit of traffic across to you as well! Feel free to email me and let me know what you think.